How Do We Use the Valuentum Buying Index? - Valuentum Securities Inc.
You are here: Home » » How Do We Use the Valuentum Buying Index? 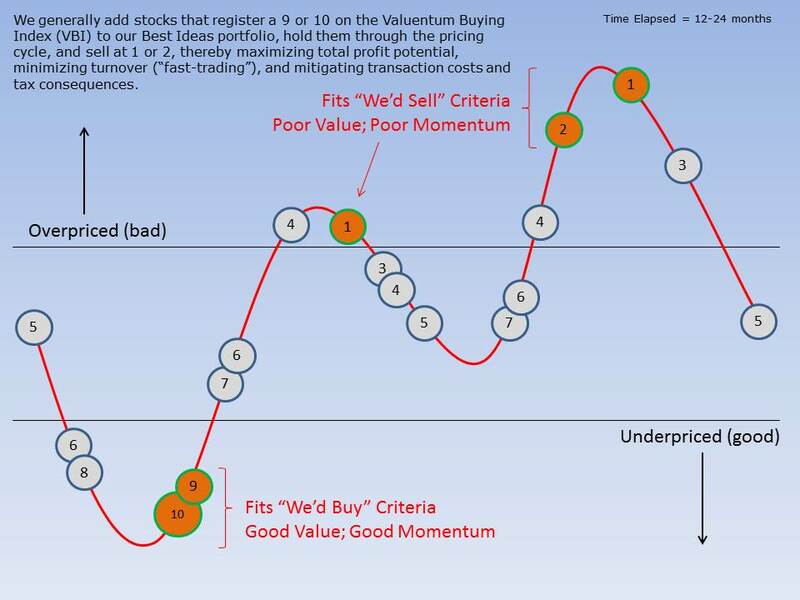 How Do We Use the Valuentum Buying Index? Image shown for informational/illustration purposes only. Valuentum is an investment research publishing company. How Do We Use the Valuentum Buying Index (VBI)? We often receive questions about how we use the Valuentum Buying Index (VBI) rating system, one of the key metrics we use to source ideas, but we think it is equally important to mention up front that it is only one of the many facets of our website and services. For example, if you haven't checked out the Dividend Cushion ratios on the stocks in your portfolio or the dividend growth product (from individual reports to the newsletter and beyond), surely you are not maximizing your membership! Don't forget about the Economic Castle rating and the Nelson Exclusive publication, too. No matter your strategy or process though (it is not for us to say what is best for you), the Valuentum Buying Index rating system is still a helpful tool to have at your disposal, even if you are not using it. Admittedly, the VBI, as we call it, is not as easy to evaluate as 1, 2, 3, or even buying 9s and 10s and selling 1s and 2s until their VBI changes upon the next update. Generally speaking, we measure the process over longer-term time periods--from the time a company registers a rating to a defined time in the future--not an interim update basis. Please read more about the parameters of a case study here, where Valuentum Buying Index ratings, as of September 2013, were recorded and the performance of stocks were measured from that time through September 2014. With prudence and care, the Valuentum Buying Index process and its components are carried out. Our analyst team spends most of its time thinking about the intrinsic value of companies within the context of a discounted cash-flow model and evaluating the risk profile of a company's revenue model. We have checks and balances, too. First, we use a fair value range in our valuation approach as we embrace the very important concept that value is a range and not a point estimate. A relative value overlay as the second pillar helps to add conviction in the discounted cash-flow process, while a technical and momentum overlay seeks to provide confirmation in all of the valuation work. There's a lot happening behind the scenes even before a VBI rating is published, but it will always be just one factor to consider. Within any process, of course, we value the human, qualitative overlay, which captures a wealth of experience and common sense. We strive to surface our best ideas for members, and flying blind is never a good strategy, in our opinion. In probably one of the most obvious cases, for example, an experienced investor knows when a price-to-earnings (P/E) ratio isn't informative (as in the case of negative or negligible earnings), but a quantitative rating system that uses a P/E ratio may not know any better. That's why the VBI has checks and balances and focuses on the discounted cash-flow process first and foremost, but the human, qualitative overlay is still extremely important, especially when considering various business models and unique "un-modelable" risks. In our opinion, a golf club is only as good as the player that uses it, and in a similar light, a financial model or a rating system is only as good as the user that applies it. That said, for the sake of transparency, we measure the performance* of the portfolios in the Best Ideas Newsletter and Dividend Growth Newsletter. The portfolios, in part, represent data points measuring the outcome of the work we do on the website, rolled into an assessment: our best ideas for each respective strategy. The ideas in the portfolios in the Best Ideas Newsletter and Dividend Growth Newsletter have been evaluated by our analyst team for consideration in the newsletter portfolios. The thoughts behind the weighting of each idea and the portfolio management process revealed in full transparency on a month to month basis may be worth the cost of a membership alone, even if you're not using the portfolios! Here's why this is important. In a market environment where more than 90% of large-cap funds have trailed the S&P 500 in the 5-year period ending August 31, 2016, the Best Ideas Newsletter portfolio* has exceeded its benchmark return over a similar time period. What's more, we showcased this performance in full transparency, and we wrote every single day, and some days weren't all that great. When patience may be the secret to success in investing, a lot could have gone wrong with the temptation to do something each day. Obviously, we're very disciplined, but we also credit the portfolio outperformance to the VBI methodology itself. It is a very helpful tool. * Actual results may differ from simulated information being presented. The High Yield Dividend Newsletter portfolio, Best Ideas Newsletter portfolio and Dividend Growth Newsletter portfolio are not real money portfolios. Results are hypothetical and do not represent actual trading. That said, let's talk about how the VBI helps to inform which ideas we include in the Best Ideas Newsletter portfolio. This is where some clarification is probably important. For one, the word choice is critical, "inform," because the VBI is generally just one factor that goes into whether we add a company to the Best Ideas Newsletter portfolio, even if the VBI is one of the most important factors. Second, the timing element or duration concept is a key consideration. We've noticed via our statistical backtesting that a momentum factor can be much more pronounced (powerful) over longer periods of time. This was one of the interesting findings of our academic white paper study (2012). We try to consider this dynamic with the update cycle of our reports (and the time horizon for ideas to work out). That's why our reports are updated regularly (generally on a quarterly basis) or after material events and not daily or weekly. Perhaps most practically though, we don't think portfolio churn is the way to generate outperformance. Momentum may be high turnover, but Valuentum is low turnover. Though the time frame varies depending on each idea that we consider for the Best Ideas Newsletter portfolio, we would expect our best ideas to generally work out over a 12-24 month time horizon (on average). Not all ideas will be successful, however. Our "holding period" is targeted to be much, much longer for some ideas in the Dividend Growth Newsletter portfolio, as income and dividend growth are other key factors (in addition to the Valuentum Buying Index and capital appreciation potential). The time horizon or duration concept is where the Valuentum Buying Index rating system becomes more complicated than a simple 1, 2, 3. For example, we tend to "add" stocks to the Best Ideas Newsletter portfolio when they register a 9 or 10 on the Valuentum Buying Index (VBI), "hold" them for some time depending on a number of variables (the VBI, market conditions, sector weightings within the portfolio itself), and then we tend to "remove" stocks from our Best Ideas Newsletter portfolio when they register a 1 or 2 on the VBI. You'll notice that we have a qualitative overlay for the Best Ideas Newsletter portfolio (and one for the Dividend Growth Newsletter portfolio, too, based on dividend-related considerations). But why don't we churn our ideas by updating daily and trading a lot? Obviously, we don't think that's the secret to investment success. In quite the opposite approach, we strive to maximize profits on every idea that we pursue, with the understanding that momentum does exist and that prices over and under shoot intrinsic value all of the time. For example, as shown in the image above, a value strategy (10 --> 5) truncates potential profits, while a momentum strategy (4 --> 1) ignores profits generated via value assessments. 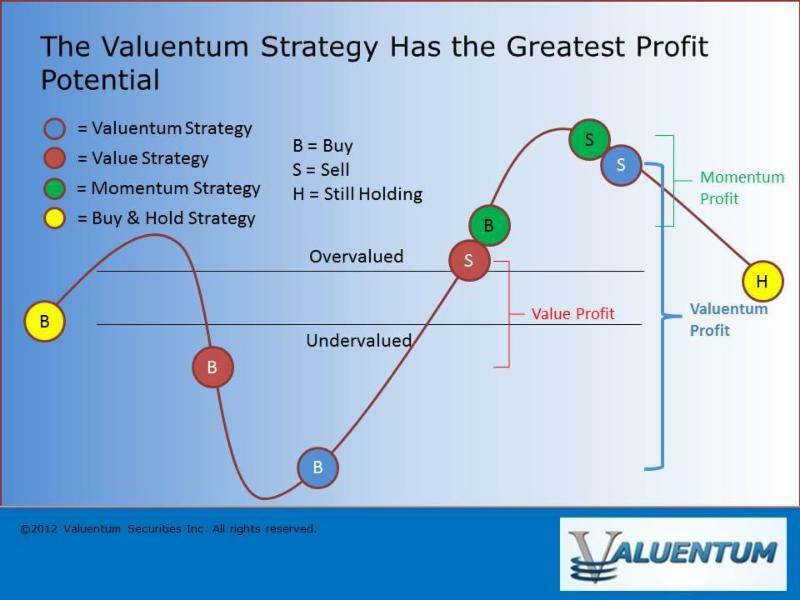 At Valuentum, we're after the entire profit potential of each idea. So, for example, if a firm is added to the Best Ideas Newsletter portfolio as a 10 and is removed as a 5, we would have truncated profit potential by not letting it run to lower ratings. Most of our highly-rated Valuentum Buying Index rated stocks have generated the "outperformance" of the Best Ideas Newsletter portfolio, but these stocks' ratings declined over time as they were held (a good thing -- a declining VBI rating generally means the share price has advanced, assuming all else is well). Regarding the Valuentum process, as it is executed in the Best Ideas Newsletter portfolio, we do not "add" all stocks that register a 9 or 10, nor do we add the ones we do immediately thereafter. For example, Google (GOOG, GOOGL), now Alphabet, a current Best Ideas Newsletter portfolio "holding," registered a 10 on the Valuentum Buying Index, but we remained patient and didn't "add" the company to our portfolio until after it reported earnings at the time, providing us with an even better entry point (as new information came to light). There are more "structural/timing" instances like the one with Alphabet, for example, that are extremely difficult to capture in any model, and understandably aren't as obvious to those outside looking in. Macro-economic, broader market valuation, and sector weighting considerations are other factors that impact the qualitative portfolio management process. But why not add every highly-rated stock on the Valuentum Buying Index to the Best Ideas Newsletter portfolio? Think of it as if you were to imagine a value investor not adding and holding every undervalued stock to his/her portfolio. He or she wants the very best ones, in his or her opinion -- obviously, that means having to leave some good ideas behind. And then, of course, there are always tactical and sector weighting considerations in any portfolio construction, yet another reason why the human touch remains a vital aspect of the Valuentum process. At the core of how we use the VBI in the Best Ideas Newsletter portfolio, however, is a qualitative portfolio management overlay. The VBI rating helps to inform the process, but the Valuentum team makes the allocation decisions of the newsletter portfolio on the basis of a number of other firm-specific and portfolio criteria. Sometimes, under certain market conditions, we may even have to relax the VBI criteria entirely in order to do what we think is required to achieve newsletter portfolio goals. There have been more straightforward opportunities in the Best Ideas Newsletter portfolio, too, especially in the case of EDAC Tech, which tripled since it was added to the newsletter portfolio (never registering below a 9 along the way), and then of course, Apple (APPL), Visa (V) and Altria (MO), but it is usually through the nuances of the process that one truly comes to understand it (as in the eBay example). Not to be overlooked either, the Valuentum Buying Index rating also informs us when we may consider "removing" a position from the newsletter portfolios. Kinder Morgan (KMI), for example, registered a 1 on the Valuentum Buying Index just prior to its notorious fall and dividend cut. The VBI ratings on each stock's most recent 16-page report, downloadable directly from the website at www.valuentum.com, reflect our current opinion on the company. In all, the Valuentum Buying Index rating system, as with all methodologies, helps to inform the investment decision process, but in constructing the newsletter portfolio, a qualitative overlay is not only necessary, in our view, but helps to optimize performance. If the returns of the Best Ideas Newsletter portfolio during the past 5+ years are any measure of the VBI rating system, it is performing fantastically well. Of course, please always contact your financial advisor to determine if any idea or strategy may be right for you. This article was updated June, July 2017. Actual results may differ from simulated information being presented. The High Yield Dividend Newsletter portfolio, Best Ideas Newsletter portfolio and Dividend Growth Newsletter portfolio are not real money portfolios. Results are hypothetical and do not represent actual trading.